Samsung has officially launched the flagship A-series smartphone, A9 Pro in India at a price tag of INR 32,490. The phone carries a 6 inch, 1080p Super AMOLED display protected by Gorilla Glass 4. The same glass has been used to protect the rear section of the phone. It measures just 7.9 mm in width and carries a huge 5000 mAh battery with talk-time of 33 hours (3G) and music play time of around 109 hours. 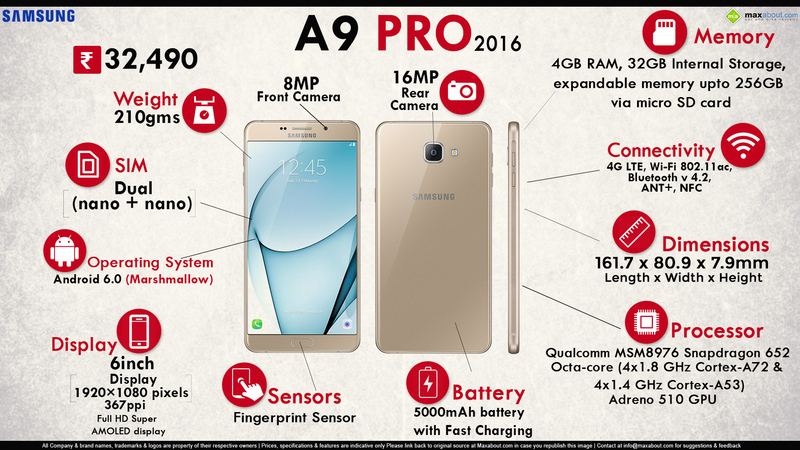 Galaxy A9 Pro uses an Octa Core CPU with Snapdragon 652 chipset coupled to 4 GB of RAM and 32 GB of internal storage. The expandable memory is available through microSD card slot, supporting up to 256 GB of extra memory. The phone weighs extraordinarily heavy at 210 grams. It comes with features like Samsung Pay, 16 MP rear camera with LED flash and 8 MP front camera. It is even equipped with a fingerprint sensor, LTE 4G services and fast charge option. The phone comes with Android Marshmallow (6.0.1) out of the box. It will be available across India from 26 September 2016.